LG OLED55B7V review | What Hi-Fi? LG’s 2017 OLED range is pretty unusual. Rather than ramping up the picture-processing features as you go up the range, all ten TVs (five models, each in two sizes) have the same panel and the same processing and features. The differences come in the form of the aesthetic design and the built-in speakers. In theory, it means anyone planning to partner their TV with a separate sound system (something we’d always recommend) should be perfectly well served by the most affordable model in the range. Actually, and perhaps stranger still, there’s not a single most-affordable model but two identically priced and specced models: the C7 and this B7. Both are available in 55in or 65in versions. These models even have the same speaker systems, the only real difference being the shape of the stand. The point, it seems, is exclusivity - the C7 was originally only available through Currys. MORE: What is OLED TV? The OLED55B7 has the most basic sound system of the 2017 LG OLED range. It’s actually a bonus for the aesthetes, in that it leaves the face of the chassis entirely free of speakers. Instead you have a clean and simple display, surrounded by a thin bezel and an elegant crescent-shaped pedestal stand. This stand is the biggest different between the B7 and C7, the latter of which has what LG calls a “stiletto” stand. Opinion is divided among the What Hi-Fi? review team as to which looks better, but certainly neither is ugly. The panel section itself is extremely thin, but there’s a protrusion towards the bottom that houses the TV’s processors, connections and speakers. It’s nearly 5cm at its thickest point but, even so, it’s still a smart-looking telly. Most TVs these days are pretty intuitive when it comes to picture settings. The LG B7 takes things a step further by automatically selecting a different array of presets depending on the type of programme you’re watching. These are generally pretty good, but there are some quick and easy adjustments you can make to get even better picture quality. Out of the box, the default picture mode is Eco and the Energy Saving feature is switched on. We’d recommend switching to Standard mode, turning Energy Saving off and reducing the contrast to reveal more detail in the brightest whites. Switching Dynamic Colour to Medium also adds extra punch to proceedings. We prefer the picture with the TruMotion setting switched off, but you may choose to put a little de-judder and de-blur on (even though this occasionally adds some artefacts to very tricky motion). You may also want to switch full HDR support on, which has to be done on an input-by-input basis. Play HDR or Dolby Vision content and the TV will switch to the Cinema Home mode, which is excellent by default - we’d change the White Balance to Medium or Cool, though, and again turn TruMotion off. Reviewing a TV that supports Dolby Vision, as the LG B7 does (as well as HDR10, HLG and Advanced HDR by Technicolor), we naturally make a beeline for Netflix’s selection of Dolby Vision titles. It’s not immediately obvious what Dolby Vision adds above and beyond the standard HDR signal, but it’s nice to know what you’re watching is as the content creator intended. And it is a stunning picture. For all its faults, Marco Polo provides some brilliant test material – the stream of dark scenes lit by candles and fires plays to the OLED TV’s strengths. The feast scene in episode three is a perfect example, as the LG B7 combines pitch blacks with bright, warm flames from the open fire. The best LCD TVs will go brighter, as do some more recent OLEDs, but overall contrast is still undeniably excellent. Insight into dark parts of the picture is superb, allowing you to pick up details other TVs lose to darkness. There’s more detail in the bright bits, too, with the flames proving a complex, shifting pattern of warm hues around a white-hot centre. This is another area LG has focused on for its 2017 OLEDs, and the dedication has certainly paid off. This scene contains a fair amount of fast action, as characters wrestle for the entertainment of the gathered VIPs. The LG is fast enough, even with TruMotion switched off, to exhibit control and composure (with just a small amount of natural and acceptable blurring). Sony’s A1 has the advantage here, in that its motion-processing is pretty much flawless. The Sony is more dynamic too, using some clever processing to add greater punch to the panel (also supplied by LG). But it’s worth remembering the Sony has always been and continues to be a good deal more expensive. 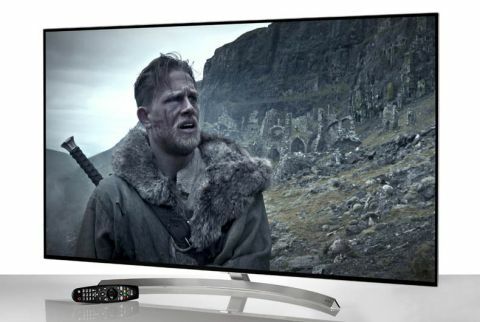 With only so much 4K HDR content out there, you’re likely to be watching 1080p shows and movies much of the time - the LG handles these admirably. Contrast is once again the standout element, but the B7 also digs up loads of fine detail, defining edges crisply without over-sharpening or exaggerating. It’s a very natural picture all round, in fact. You never get the sense that what you’re watching is anything but precisely what was intended. With TruMotion switched off, you’re never made aware of what the TV is up to, which can happen with traditional LCDs as they raise and lower a backlight to make the most of each scene. There’s nothing to distract you when watching the B7, so you find yourself entirely engrossed in the picture. If you still watch DVDs, you’ll be pleased to hear the LG B7 does a quite astonishing job with standard-def content. The picture is detailed, balanced and clean, to the extent that it’s hard to believe how much of what you’re watching is being made up by the screen. No other 2017 4K TV (barring other LG OLEDs) is as good with SD content as the B7. LG knocks it out of the park in terms of its gaming performance too. Not only do you get the same excellent contrast, crisp definition, fine detail and balanced colours seen elsewhere, there’s practically no input lag. We measured 21.4ms, which is low enough that you'll never notice. If you’re a serious gamer, this is a seriously good choice of telly. As LG is using sound as the differentiating factor between its 2017 OLEDs, you could be forgiven for assuming the B7 sounds like a swordfight in a beehive – but that’s not actually the case at all. Thanks to downward-firing speakers, there’s an unfortunate indirectness to the sound the more sonically endowed E7 and G7 don’t suffer. The soundstage doesn’t stretch particularly far into the room as a result, but it is still spacious, dynamic and clear by flatscreen standards. We’d still recommend adding a separate sound system, but that’s no black mark against the B7. As with every 2017 smart TV from LG, the B7 runs on the webOS 3.5 platform - a fairly light update on what its TVs ran last year. It’s colourful, welcoming and user-friendly, with all apps and sources being treated equally and laid out as bright cards that can be rearranged and removed. It’s also smooth and snappy, which aren’t compliments that can be aimed at the Android TV platform the Sony A1 has on-board. The remote control is excellent, too, combining the motion-sensing pointer skills of LG’s pre-existing Magic Remotes with a full suite of buttons - they're of ergonomically sound size and shape. There are dedicated buttons for Netflix and Amazon, and you can add shortcuts to other apps and sources which can then be accessed via a long-press of whichever number button you’ve opted for. The ability to turn off the motion-sensing feature of the remote so it can be used as an old-school clicker would be nice, but it’s a minor issue. We had a suspicion the B7 and C7 would be the choice picks of LG’s 2017 range, and it’s turned out to be the case. Here you get the same superb picture as the E7, G7 and even the W7, but at a far more reasonable price. And that price has only become more reasonable as time has passed. At the time of updating, the B7 was widely available for less than £1300 - a huge discount on the £3000 launch price. And it's still a really excellent TV. Yes, LG's 2018 models are better, but not vastly so. A number of small improvements, almost entirely on the software side, result in a sharper, brighter picture, but the core qualities are very similar. For the sake of £200 or so, we'd suggest paying the extra for the newer OLEDC8PLA, but if the gap is much bigger than that, the OLEDB7V remains a tantalising proposition.